We have so much information to share we are busting at the seams. We decided this new blog would be a great way to share information and ideas. We just got back from Bernina University last night. My head is still spinning. We saw a lot of new products and attended a lot of wonderful classes that we will be teaching this Fall. The new Bernina Quilting machines were all the rage at Bernina University. Talk about worth the wait. I was not a good partner in class. I did not want to share my machine. I LOVE!!!!!!!!!!!!!! this machine. 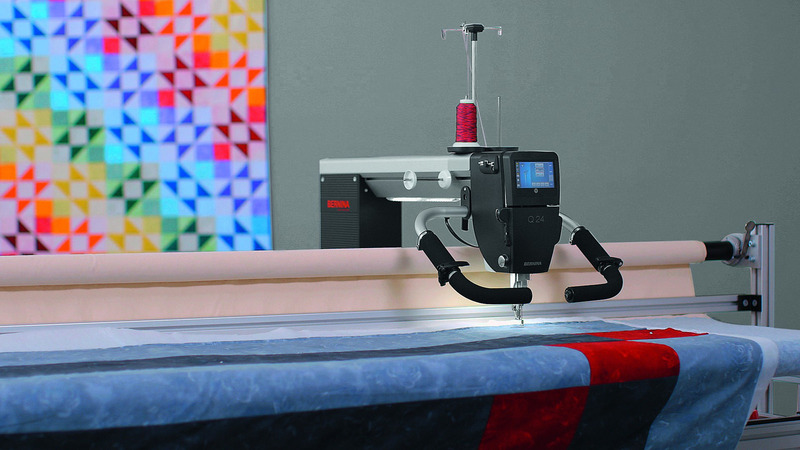 The quilting machine is equipped with the Bernina Stitch Regulator (BSR). Everybody who knows about the BSR knows it is one of a kind. These wonderful new machines are equipped with two regulators to keep stitches absolutely perfect. Amazing. We got a sneak peak of the new Q-Matic. This is the automation that will be available later this year. This will allow the long arm frame models to run automatically. The diversity in designs with the automation is priceless. We also enjoyed using the sit down model quilting machine. This is a great way to quilt those large quilt without having to have the space of a frame model. I could keep going for hours but I hear the quilting machine calling my name. I have homework to complete.